Made by Hoopla Donuts in collaboration with Nights & Weekends. We didn’t have to think long when it came to deciding on the perfect dessert collaboration for our Cheese Bar pop-up. Located just a few blocks away from Nights & Weekends is Hoopla, Calgary’s newest (and sweetest) addition to a bourgeoning food-lovers scene. We love their vibrant corner in the Calgary Place Plus 15 almost as much as we love their take on elevated classic flavours and perfected recipes. Hoopla can be found Downtown inside Calgary Place, in the Plus 15. If your pupils just dilated upon reading that header, then this donut is definitely for you. We worked closely with Leslie Morrow - Head Chef at Hoopla - on flavour concept and testing (yes, eating donuts was how we tested) to come up with a donut that promises to be packed with Comté creaminess complimented with an apple cider glaze and garnished with even more Comté. If this sounds like a cheese bomb to you, its not… Hoopla has managed to deliver an eloquent array of flavours that highlight the mild gruyere and a mouth-melty dough with a perfect balance of sweetness. 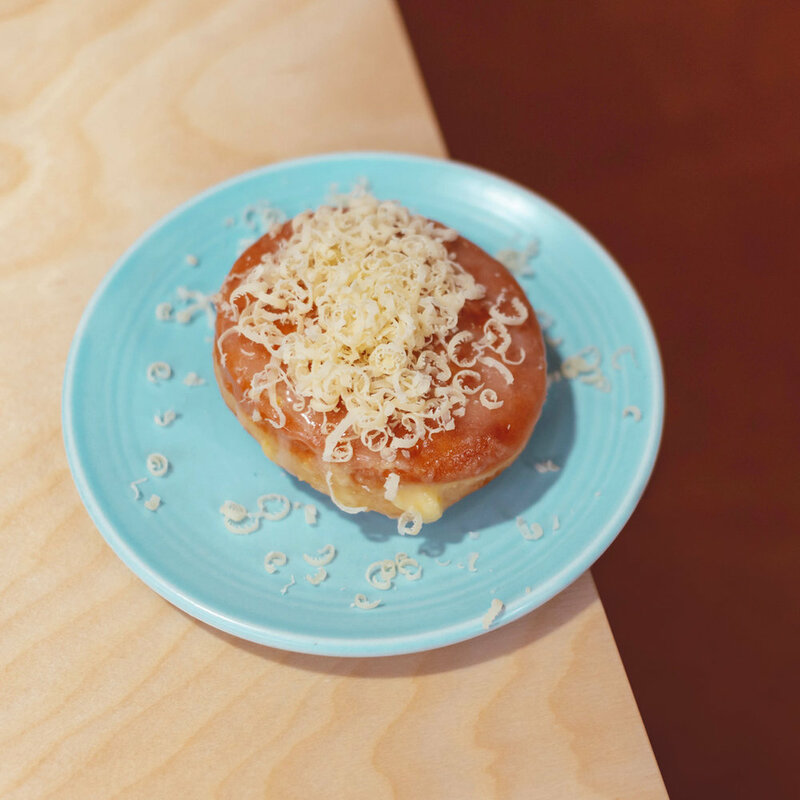 A generous garnish of freshly grated Comté to finish the donut. Find the Hoopla Comté Cream Donut our Cheese Bar pop-up from March 28th until April 9th. Like all things at Nights & Weekends, we promise it will be good, and then it will be gone. Make a reservation online through RESY now.